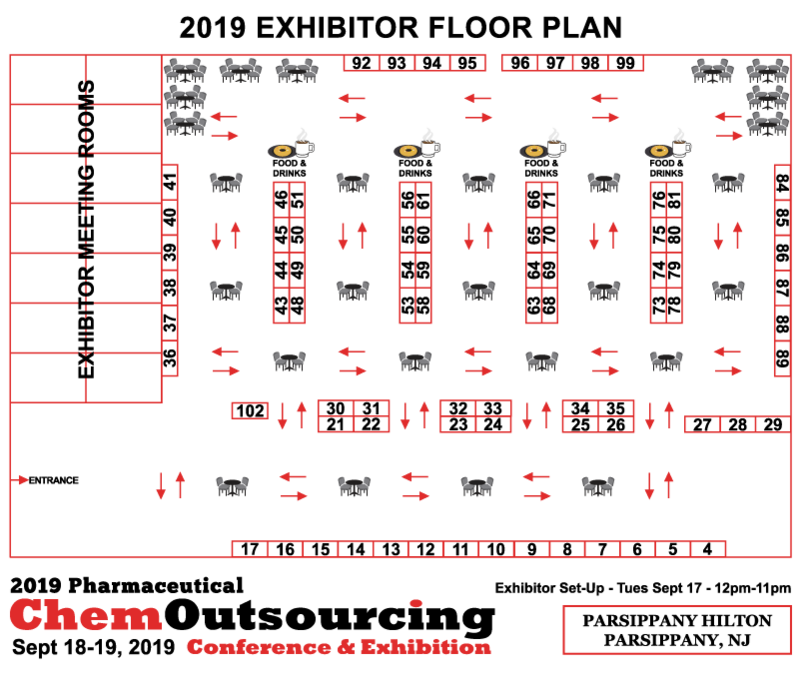 Exhibitors Select Your 2019 Space! Contact Mark Alexay at malexay@chemoutsourcing.com to book your exhibit space and include two space preferences in your email. Exhibitors are provided two FREE, full-access tickets for your staff; additional ones can be purchased at the exhibitor-discounted rate of $995 Email for registration the names and emails of your staff to be registered for the event. You can change them anytime at no cost. Exhibitors may not register staff directly Exhibitors can order FREE rectangular white cloth skirted tables 6 feet long x 2 1/2 feet wide, 2-4 chairs and/or white cloth covered round tables, WIFI, easels, carpeting during set-up on Tues September 17 from 12pm-11:00pm Electric is ordered directly from the Hotel 2 weeks before event (see link above). The hotel electricity cost is about $50 for the entire event. Want custom furniture? See link below on your right. 102, Alichem 60, Fareva 69, PolySciences, Inc.
Book your space directly on the registration page of this site or contact Mark Alexay at malexay@chemoutsourcing.com or at 201.452.4023 for further information. If you are interested in a specific booth please indicate this in your call or email.